Each motor has to turn in a different direction if mounted on the opposite sites of the board. This can be achieved by swapping two motor phase wires (B and C) while the hall sensor wiring remains the same for both motors. The phase wires of the Maytech hub motors are actually the wires from the stator windings so you have to properly remove the isolation before soldering them to any connectors. Hall sensor wires use the 6-pin JST ZH connectors (model number JST ZHR-6) which are much smaller than the JST-XH which are used for balance chargers, for example. Here is a photo of the prototype. I’m planning on moving this to a bigger longboard for improved handling since the wheels are so large. Are your Maytech motors and Flier ESC doing good now? I’m thinking of building an electric skateboard according to your diagram. And I wanted to know if every part is working well at this moment. What batteries do you recommend me to choose for this? Because I’ve calculated that one motor requires 6S. So I’m thinking to buy two 8000mah 3S’s and connect them in series, so it will be 8000mah 6S. Is 6S enough for TWO motors? Do I need 12S for two motors? Now I’m gonna order only one motor. I’ll get a second one when I’ll get money (16 years old). So, should I order extra 6S battery for the second motor? Hi Jeán! Thanks for sharing your build! 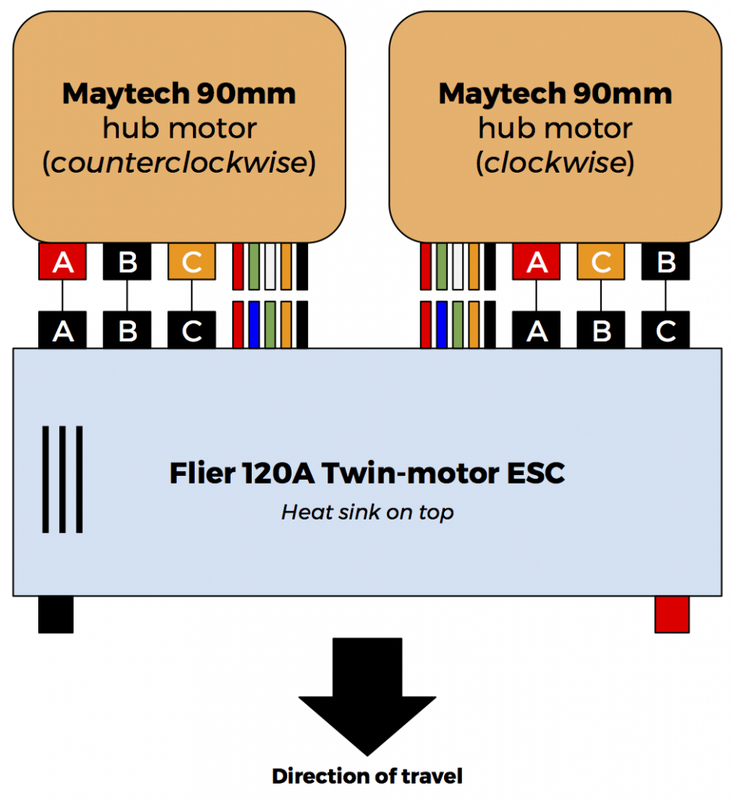 Yes, the Maytech motors work great and so does the Flier ESC. The battery voltage shouldn’t exceed the limit of the ESC which is 8S for the Flier twin-motor ESC. Any battery configuration up to 8S will work just fine. 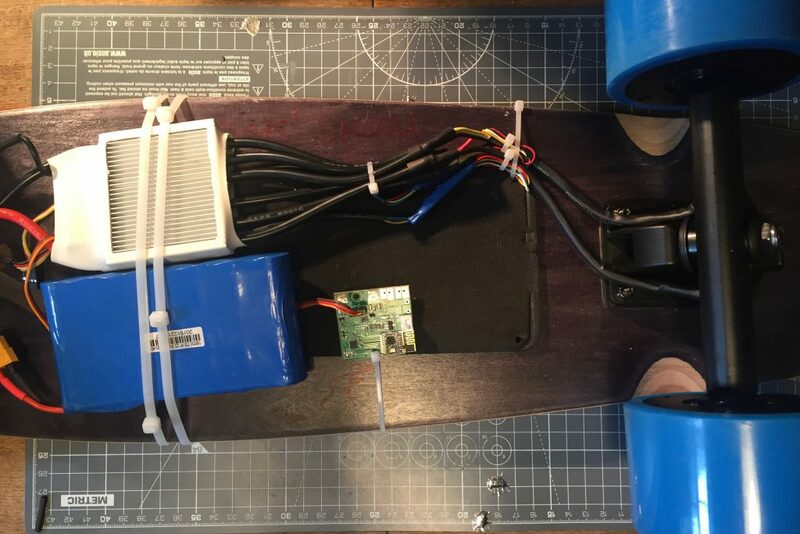 However, the top speed of the motor is directly proportional to the battery voltage so with a 6S battery you’ll have 6/8 or 25% lower top speed compared to a 8S configuration. The battery Ah rating only impacts your range so anything that fits your budget will work just as fine. Most of the RC battery packs are able to deliver enough current for all of the hub motors. For example, the Maytech 90mm motors have a maximum power output of 450W or 900W with two motors. So the battery pack needs to deliver a maximum of 36A (900W/25.2V). This 6S Zippy 3.3Ah battery is rated at 35C or 115A of discharge current (3.3x35A) which is three times more than you actually need.